Sonja Kruse is still spreading the Ubuntu story. Photographed on Mandela Day 2012. Sonja Kruse had a seemingly perfect life. She was making good money at a great job, surrounded by fantastic friends and family. But then she had a dream. In it she took a backpack, a camera and R100, and started walking. So to fulfil the dream she resigned and started a journey around South Africa to discover Ubuntu. When Alison Westwood spoke to her, she’d already been to 95 towns and stayed with 136 families from 13 cultures. How does it work and where did you start? It was a simple dream that started very simply. On the first day I went to a taxi rank and told a few people about what I wanted to do. One woman launched into a big discussion about how I shouldn’t do it, but that just fuelled the spark. So the next day we caught a taxi together to a township. Within five minutes, I had found a woman who took me in. She and her two children lived in one room with a bed, a two-plate stove and some cupboards. That night she slept on the floor and I slept in the bed with the kids. That was the beginning of the journey, and that experience was how it’s been all along. Have you had any rejections? I actually have to think about that, which probably means no. The response has been overwhelmingly positive. I’ve stayed in townships, on farms, in shacks with rats and in multimillionaires’ mansions, with ANC Youth League and AWB supporters, with hunters, vegetarians and Rastafarians. What’s the most important thing you’ve learned on this journey? I think I’ve always been quite a judgmental person, but this journey has taught me not to be, because I’m humbling myself. When people take you in and you’re sleeping in a bed they’ve given you, eating food prepared by their hands, they may have completely different viewpoints, but judging them is difficult when they’ve been so generous. What have been the most difficult things about the journey? I struggled with money a lot. It was difficult for me to go to somebody and say, ‘I need some food and money because I can’t help myself’. But people have different ways of giving Ubuntu and I’ve been able to carry that with me. One family gave me a bag of red onions to take to the next family. That was exchanged for a jar of apricot jam. This went on for quite a while until a dog ate the fruitcake! I still carry the love of all the families I’ve stayed with. What do you think people get out of helping you? A lot of people thank me when I leave. One woman in Knysna was quite sceptical when she heard my story – one of the few times this happened to me. But when I left, she thanked me for showing her she can open her home. The people who help me want to know I’m fine – I have to SMS updates to 190 people. I’ve realised how connected we all are and if we can tap into that connection, we’ll help one another. I hope I’m showing South Africans that anything is possible. Have you ever felt threatened? How can people experience Ubuntu without doing what you’re doing? One person I stayed with didn’t have a geyser, so every day he was boiling water for about three quarters of an hour so that I could have a bath. The next morning, his boss came to visit and I told her the story of his amazing generosity. What she took from that was, ‘I can get him a geyser’. So it’s passing it on, passing it forward, even just smiling at somebody. First published in the October 2010 issue of Getaway Magazine. Read more about Sonja’s adventures on her blog. 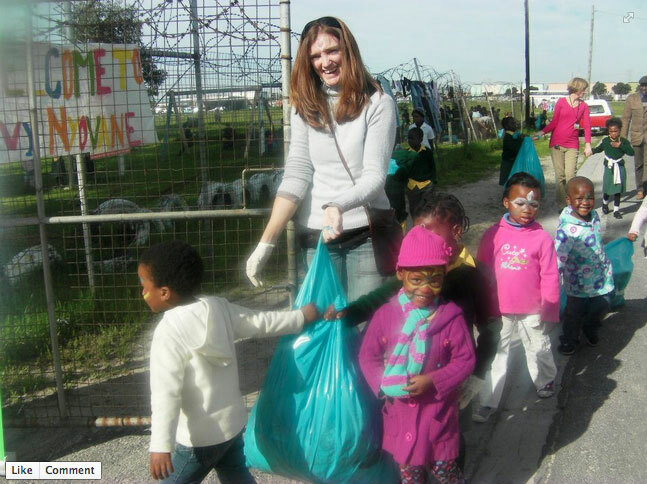 Posted in InterviewsTagged journey, sonja kruse, South Africa, ubuntu, ubuntu girlBookmark the permalink.